A map of Haiti, territories are cities and connected by major roads. The native Taino - who inhabited the island of Hispaniola when it was discovered by Christopher COLUMBUS in 1492 - were virtually annihilated by Spanish settlers within 25 years. In the early 17th century, the French established a presence on Hispaniola. In 1697, Spain ceded to the French the western third of the island, which later became Haiti. The French colony, based on forestry and sugar-related industries, became one of the wealthiest in the Caribbean but only through the heavy importation of African slaves and considerable environmental degradation. In the late 18th century, Haiti's nearly half million slaves revolted under Toussaint L'OUVERTURE. After a prolonged struggle, Haiti became the first post-colonial black-led nation in the world, declaring its independence in 1804. 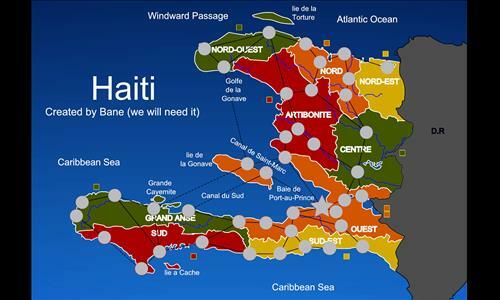 Currently the poorest country in the Western Hemisphere, Haiti has experienced political instability for most of its history. Review by okasan on 10/3/2014. Visually appealing map, small and fun. Not sure I like the cul-de-sacs (Bella-Anse, Marigot, Petite Trou de Nippes, Fort-Liberte) but overall a nice quick game in a beautiful setting. Review by sekireialpha on 12/11/2014. Review by Vole on 12/13/2014. Nice little map, with some neat twists. I like the splitting of the Sud Est bonus. Review by Nathan on 10/3/2014. Fun little map. I agree with the other poster about the dead-ends. It seems like they could easily be connected to the nearby territories. Other than that, I would like to see a distribution mode or two as they help ensure a fair start on smaller maps. That being said, it's not as necessary here as it is with many other maps because of the inherent balance of this map. Review by NinjaNic on 10/4/2014. I have to say, this map actually looks pretty nice. Good work! Review by otinanaimail on 10/12/2014. Review by King C******* V on 12/11/2014. Review by stormbringer on 5/7/2015. Review by Andalorium on 12/20/2016. Fun Little map, though what I loved the most was the color. Review by JKike3 on 3/20/2019. Wonderfull map, good bonuses and some missing connections between territories to change up the game and make bonuses defensible. Review by Krille on 3/15/2015.